Bayoán Ware has two deadlines to meet on this particular Friday. First, he is putting the final details on a grant application that could help new and emerging food businesses in the Columbia Gorge have a place to grow. He also has to finish his application for a second year working for Resource Assistance for Rural Environments at the Port of The Dalles. RARE is an AmeriCorps program through the University of Oregon’s Community Service Center. Its aim is to increase capacity of rural communities to improve their economic, social and environmental conditions. The program does that by providing trained, graduate- level participants who live and work in rural communities for 11 months. RARE begins its 25th year with the fall class of RARE planners. Wasco County has benefitted from more than a few RARE planners through the years. Some have stayed in the area. The current RARE group includes three involved in Wasco County-related issues. Bayoán grew up in Chicago and was living in Puerto Rico with his mother when he learned about RARE. He chose The Dalles to explore a part of the country he had never seen, and for the opportunity to experience life in a small town. His projects include not only the food facility but also Gorge Works, a community-based internship program. Bayoán Ware, a Chicago native, serves as a RARE planner at the Port of The Dalles. Photo by Kathy Ursprung. 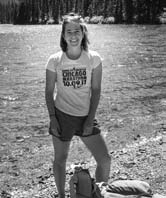 Lauren Kolojejchick-Kotch from southern Idaho is a project manager at the Columbia Gorge Tourism Alliance. The work brings together a number of her interests: economic development, regional planning, food systems and a deep sense of place. It also incorporates storytelling, a key interest of Lauren’s. Portland native Kiara Kashuba works with Oregon State University Wasco County Extension on projects related to healthy-eating education and increasing food access in the Columbia Gorge. Her RARE work involves developing plans and systems for the Columbia Gorge Food Security Coalition and the local Blue Zones project that will serve the area for years to come. “In the end, I hope that in my RARE year I have made a positive impact on the physical and mental health and well- being of our community,” Kiara says. Lauren Kolojejchick-Kotch is a project manager for the Columbia Gorge Tourism Alliance. Photo courtesy of Lauren Kolojejchick-Kotch. 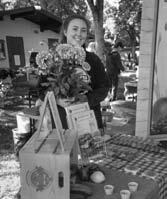 Once her RARE year is complete, Kiara plans to stay and take a job with Gorge Grown, a local food and farm advocacy group. A number of former RARE planners continue to have an impact locally. Michael Held, a West Virginia native, preceded Bayoán at the Port of The Dalles. After earning his master’s degree in public administration, he was looking for a community where he could set roots and begin a career. Michael worked on plans for the Columbia Gorge Industrial Center—the newest industrial center at the Port. He also launched a process to reconcile wetland issues in the industrial area. He attributes his success and a deeper understanding of his professional interest, ambitions and capacities to RARE. Michael lives in Salem, but continues to affect Wasco County through his work with the Rural Development Initiative. Kiara Kashuba holds a cooking demonstration as part of her work with OSU/Wasco County Extension. Photo courtesy of Kiara Kashuba. Carrie Pipinich, a Seattle native, came to The Dalles in 2011 with a master’s degree in urban and regional planning. Working for the Mid-Columbia Economic Development District, she coordinated a group of regional governments in exploring opportunities for collaboration and worked on MCEDD’s comprehensive economic development strategy for the region. She also worked on a needs analysis for the regional housing authority. Today, Carrie works as a project manager for MCEDD, coordinating the Wasco County Economic Development Commission and helping bring broadband connectivity to rural communities, among other things. She also plans to supervise a new RARE planner for MCEDD this fall. Matthew Klebes, a New Hampshire resident, came to The Dalles in 2013 to coordinate the town’s fledgling Main Street program. He and his wife, Krystal, had recently returned from the Peace Corps in The Philippines, a program RARE supports. 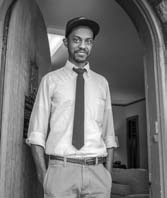 Matthew stayed in The Dalles after his 11 months with RARE, first serving as executive director of Main Street and then as assistant to the city manager at the city of The Dalles. Jeremiah Paulsen, of Sequim, Washington, met Michael, Carrie and Matthew while living in The Dalles and working as an AmeriCorps volunteer in Wishram, Washington. When that post ended, he decided the professional development aspect of RARE sounded interesting. Jeremiah went to work for Matthew on Main Street projects. A few months later, when Matthew took the city job, Jeremiah took over as Main Street executive director. Jeremiah praises the connections he has forged through RARE. Amanda Hoey’s story is a little different from the others in the group. Raised in The Dalles, she worked with AmeriCorps and then RARE in 2005- 2006 on the Oregon Coast, developing youth entrepreneurship programs. Her RARE ties brought her back home. “I had never heard of MCEDD before,” she says. Another RARE planner told her about a project manager job at the organization and she applied. Today, she is MCEDD’s executive director.